How many of you remember your first day on skis? 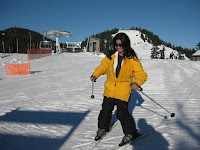 Today one of my step grandchildren had her first day on skis. I think it was a good experience and I hope Zandrea will grow to love the sport as much as her mother Priscilla and I do. We had a good family time with the three generations of a blended family and husband -to- be in the group. As we went through the process of getting rentals and getting everybody set up for the day, I was reminded of my first time for skiing which was also at Greek Peak. I wasn't so fortunate to have a lesson with a pro and was fitted with boots that were too small and skis too long. All in all it was a day of survival. My first impression was, if this is the way it is each day, I am not sure I want to go through the torture. Fortunately things got better and I enrolled in a multi lesson program with some competent instructors. In the old days the progression to parallel skiing was a slow and deliberate process starting with snow plow, stem turns, moving into parallel turns and unweighting. I still recall the first rides on the intermediate slopes as terrifying rides of marginal control. It is great that we now have improved instructional technique and much better equipment. At coffee today, I met Al and Glynda of Dryden who started skiing in the their fifties and sixties. It is great that seniors can take up the sport with ease and enjoy the winter. I hope the ski areas everywhere will pay attention to the potential first time senior skiers. It seems to me that the boomer generation ought to be a market to consider. They have the time and by now ought to have the resources to afford skiing. Meanwhile readers, I would like to hear stories of your first time on skis. I remember mine. My dad took me to the old "Snow Crest" on Page Green road in the late 1940's. You got to the top on a rope tow (an adventure in & of itself!). I got off the tow at the top and headed straight downhill (before my dad could teach me a "snowplow"). Only the snow fence at the bottom stopped me-and I nearly went through that. Needless to say-I learned to stop before I was allowed to the top again. The other thing that I remember was that everyone had to "pack down" the hill by side-stepping to the top. No groomers back then!